A nice stretch of agreeable weather departs this weekend when perhaps 2-6 of fresh snow arrives at Tahoe ski resorts. 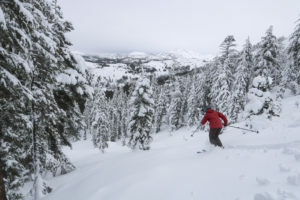 Two storms should bring more powder days like this one at Kirkwood Mountain ski resort in Lake Tahoe. The storms could be accompanied by winds as strong as 70 mph over the Sierra ridges. Allegretto believes the snow levels Friday night should start at around 7,500 feet and lower to 7,000 by Friday evening. He predicts the storm will last into Saturday night and be vicious at times with ridgetop wind gusts increasing to 70-plus mph and possibly affecting upper mountain lift operations at various Tahoe ski resorts. Snow levels will continue to fall, dropping near sea level by Tuesday morning. Ridgetop winds will be brutal again, gusting 60-70-plus mph. Allegretto says we could see an additional 19-41 inches of snow at Tahoe ski resorts by Tuesday morning, including 14-31 inches at lake level. The National Weather Service (NWS) in Reno predicts the first storm will arrive around 4 p.m. Friday and remain until early Sunday morning. The NWS is predicting the storm could bring heavy snow, with anywhere from 15-30 inches possible above 7,000 feet. Elevations will drop as low as 6,000 feet. A pair of storms over the next five days could deliver 2-6 feet of snow to Tahoe ski resorts like Mt. Rose. The NWS believes early Sunday morning may bring a small break from the storms. 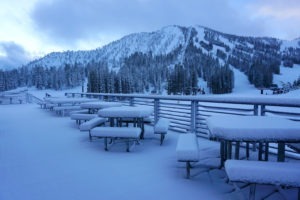 But another storm should arrive at Tahoe ski resorts that night. But the weather service differs from Allegretto, feeling a 70-percent chance of precipitation and 2-4 inches of snow at lake level after 10 a.m. SNOW SURVEY: The Department of Water Resources conducted California’s second manual snow survey of the year Thursday at Phillips Station, reporting that results were 98 percent of average to date. DWR water resource engineer John King said the snow water content doubled since the start of January at the survey site near Echo Summit.